This is a post about school design. And the joy of a printing business. Truly. A post about school design thanks to having the pants charmed off of me when I visited the Printing For Less corporate headquarters in Livingston, Montana several weeks ago. Seeing a commecial e-printing business show first hand what a true 'learning organization' can look like from the design/layout side and the underlying principles that it celebrates. But first a story about being 8. Note: the dog to the right was one of at least 12 that I saw, roaming happily around the Printing For Less offices/halls. Talk about a perk for employees! And an atmosphere that lends itself to health/passion for all involved. 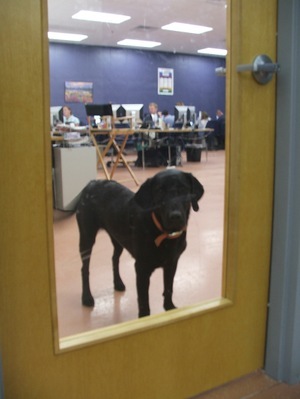 This dog was inside the firm's training room where 20 or so bright professionals (most of them moving from major cities around the US to join the PTL) were undergoing an amazing training program as client evalgelists and technical wizards all in one fell swoop. Everyone looked happy and thrilled to be there; many of which left really nice jobs and leadership positions to come to Montana. Maybe the dogs had something to do with that. Maybe. And also about what Andrew's commercial e-printing business has to say to school designers everywhere. Here's what I mean. 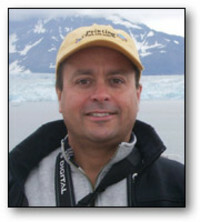 Andrew is the President & CEO of Printing For Less, the largest commercial e-printing business in the US, a company that was started in 96 at the front end of the curve in such an industry, a company that has done $24 million in revenues this past year, a company that has been featured by Inc. Magazine, Wall Street Journal, Fortune Magazine, the White House and President Bush, and endless others who are noticing something truly special happening in Livingston, Montana in the printing business of all places. Andrew's raison d'etre for starting PFL grew out of his roots running a more traditional printing company years ago, but have far more to do with a friend of his throwing out a challenge one day and Andrew being an entreprenuer at heart. He had been 'snake oil salesman' before that (his own description for selling to auto mechanics); he even ran an auto repair business (and had worked on Robert Scoble's mom's Subaru years before; hence the connection when Scoble introduced us to Andrew). When Andrew and I had dinner -- sitting at The Old Saloon, a saloon with the typical authentic western charm that only happens in places like small town Montana still -- we talked about the new offices he and his team had just built and moved into. Growth and success had clearly challenged Andrew to get into something larger, but what was particularly fascinating was the approach that Andrew took to working with his architects...and why it impressed me when I toured the facility the next day. He was extremely humble ("It's probably not as nice as some of the other buildings/designs you've seen, Christian" was how he phrased it over burgers)...and truth be told I didn't expect much except 'new' when I imagined going there the next day. Day Care and 'family' is built in; there are no other options! The first thing you see when you come walk the parking lot to the front door are little kiddos playing under the Montana sky. All employees pay a pitance to have their young kids on site with them. It's a fundamental. Andrew made it a key design driver. And the # of Baby Bjorns in the office was an indicator that for many of the employees, a family 'quality of life' decision was made without compromising their careers. And its a spectacular daycare. Small adult/kid ratio. Healthy environment. Kids loved. And obviously very happy teachers and parents on site. It wins all visitors over the second they come into the building. The main floor is designed for humans, not executives or administrators. Andrew had been told by the design team at first that a 'traditional' executive/client floor was needed. Sends the right message. Fits the design. Tradition. Andrew felt that didn't match the company's feel. Instead, the upper floor does have all of those elements -- like a typical 'entry' to a school -- but for any visitor, the real sense is that it's an open series of collaborative spaces that are designed for all team members (regardless of rank) to relax, create, rest, and connect. Every space is a learning space. Man, there just weren't any spaces in the building that didn't suggest learning, collaboration, experiment, and team. Sure, business had to be done and things were divided up by tasks and teams, but the real take-away had to do with energy and collaboration. I'd have given anything for teachers/administrators and school designers alike to have spent time on the bottom floor (ground level, due to the slope that building sits on) where the teams were moving at full speed, serving clients around the nation, and providing rigorous real-time design/printing solutions. Spaces were vibrant. 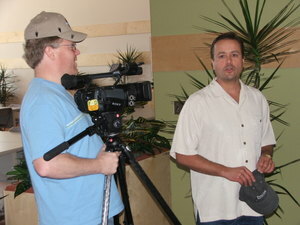 Team members were free to work in a variety of settings. And the place had a learning buzz about it. All workers are humans, learners and team members first. I was struck by one programmer/service expert that had forgone the chair entirely. He used a yoga/exercise ball as his chair -- not only did it help create a different dynamic, but it also had a huge impact on his back problems. I also liked that it allowed him to move. To bounce. To fidget. To shift. Mmmm....imagine if kids were given the same option. Imagine. We talked about this a bit, but what really struck me was that the 'trappings' of professionalism were tossed out the window with a grand investment being made instead to support 'how' people worked, created, succeeded, and collaborated. Every team member looked happy/healthy. And the spaces reflected that -- not choosing expensive design but instead being creative and letting the teams be able to gravitate towards what worked best for them. Solo. Small groups. Large groups. Formal. Informal. Inside. Outside. In other words, every space a learning space. Even hallways. Very little wasted...and a far more vibrant learning organization because of it! What I took away from meeting with Andrew is that he was passionate about a business that is often seen as 'behind-the-scenes' (less like Kinkos, and more like warehouse typically. And that he was even more passionate about technology and the ability for all businesses (no matter how small) to succeed in terms of their public 'presence' (business cards, brochures, posters, etc.). And that he was even, even, even more passionate about his team and how to create an enviroment that supported their full existence as professionals, as family members, as community leaders, and as lifelong learners. I said this was about school design. And it is. About school design in the sense that each of our students and teachers should be seen as all of the above. And that those of us in a position of leadership who control the environments they come to each day must think about how we 'design' programs and spaces. We can either empower or we can limit. The choice is ours. And, in my humble opinion, if a commercial e-printing business in Montana can create a stunning example of innovation and collaboration for every member of his team...and still be the leading firm in its industry...then what is keeping the rest of us back when it comes to providing rich/dynamic spaces that allow learners of all ages/backgrounds to achieve similar outcomes? Frankly, he spent a heck of a lot less $/SF than the majority of schools do. Every member of the community is expected to succeed and thrive. And learning happens everywhere. Maybe I'm digging too deep. Maybe not. But for one morning in Montana, I saw the future of school design and business. And I liked what I saw! Christian: This place sounds incredible. As I read your post I was thinking about how I can make my classroom a little like the printing building? I think the most important thing to remember is that everything in my class moves. We can move things so that they are more student friendly. If we start with restructuring classrooms, maybe eventually we can move on to restructuring whole buildings. One more comment, many years ago I had a student who constantly got out of his seat. I was a young teacher and for some reason thought that every student had to sit down. I'll never forget the look of thanks on his face when I told him that he could stand if he wanted to. We should all be a little more flexible. It sounds as if the president of the printing place is very flexible. Thanks Christian, Andrew is my business hero. Can't wait to get the video up from our tour onto Podtech.net. Probably in mid-September. I work at a dog-friendly start-up company. My experince confirms that having animals in a work environment is great for the humans, and is not too bad for the dogs either. We used to have an employee who'd bring his cat in to work. Thanks for this post; now I don't feel so bad about not having joined you for the tour. Can't wait for Scoble's video. Came by your post because of the mention of Montana. I live in the Flathead Valley in Glacier National Park (on the other side of the Rockies from Livingstone) and moved here from Florida. Interesting that you talk about the dogs at this company...here in Montana having your animals with you seems to be very important and I have been all sorts of places like retail stores and offices that people are have their dogs. There is a dog in workspace of the company where I work too as well as the children of the employees including mine. Being able to have your child in your workplace makes the difference, I wish more places realized that this would help many smart, creative moms out there. Angela, your echo of the dog-factor in Montana businesses (from stores on up the corporate food chain) has once again created that "Quality of Life" vibration in my head! Well said...and thanks for taking a peak into "think:lab" and sharing your experience. I have 2 dogs with me at my home office, and going for a walk with them mid-day is often the only time I lift my head up from the computer before my wife returns home each evening. If I were at an 'office' in the traditional sense and could bring Tucker the Wonderdog and Flaco (rhymes with Taco), it'd be a wonderful mix. Again, thanks for stopping by! I happened upon your website while I was working on a school assignment (researching MS Publisher info and tips for a desktop publishing class) I've now gotten lost in your website (been here over 30 mins) and am ready to move to Montana. I think I'm going to dust off my exercise ball and put it in my office! What a great idea! Thanks for all the tips. I'll pass them on to my class. Who knows, maybe I'll be calling for a quote someday. I echo your thoughts about Andrew and Printing for Less and would add that PFL is a good example of how corporations owe so much to the vision and character of their founders. Witness Jobs, Gates and Fields. All driven, but driving differently. And of course, the charity receiving the donation is the local Humane Society! We've donated several thousand dollars because PFL knows that trusting them to do their printing takes courage and should be rewarded! "All workers are humans, learners and team members first"
I really thank you for this article... my wife is a teacher, but until now I have not thought through the connections between my business and her class room. You also have given me some ideas to build a better work environment. Thanks for the post. Very interesting stuff. Interesting insight! 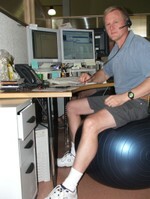 I know many who have turned in their chairs for yoga balls, but I definately see it's benefit. I love the pet-friendly atmosphere, they say petting a dog will lower one's blood pressure. Thx for the post. it is very good message. Thanks for the article, love the philosophy. As an instructor, my own philosophy is to make the info readily available in a hands-on atmosphere and just allow students to learn rather than teaching them. What a great article. I love the dog concept. You need an office that has nothing but tile floors, I bet! There's nothing quite like working for a company who's employees share the same vision as the founder, and who each have a sense of humor, and are each bright and knowledgeable in their chosen field of work. Thanks for the article. I think schools have a lot to learn from these types of environments--especially if they consider how students will be doing work. Less factory, more learning spaces. It's nice to see a company think about the broader picture and provide an excellent overall environment for their employees. People don't just look at the amount they are paid, but they look at the way they are treated. This company has some innovative concepts and I'm sure that employee retention is high. When the building, the employee programs, and collaboration is encouraged, then a stronger and more creative workplace will result. If you inspire your employees to constantly learn, then they will provide great quality and service.